Turvec’s secure, timber two-tier cycle shelter is a lockable environment to house two-tier cycle racks in a space-efficient footprint. Based on the Cubic format, with increased height to accommodate the 2Parkup double-stacker. For single height parking see the Cubic shelter. 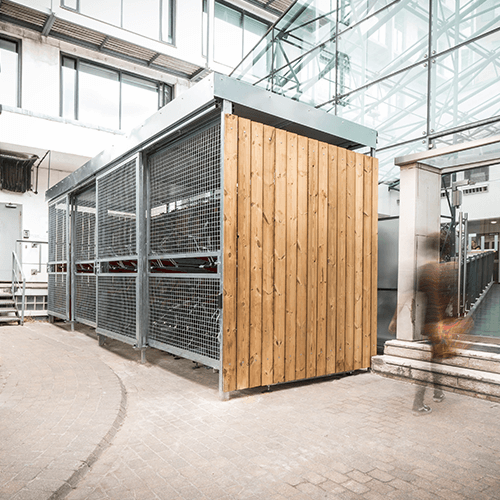 Turvec’s wooden bike shelters are fabricated bespoke for each project, and can therefore accommodate most site conditions. For ease of install, we recommend surface mounting the shelter into pre-prepared concrete foundations, alternatively we can root fix a shelter and reinstate existing substrate or paving. Timber cladding can be fitted on site, or pre-prepared on panels for a quicker process on site if desired. Cubic shelters are highly customisable and can therefore accommodate any number of bikes subject to space. If you project has a certain capacity requirement or space limitations, we can adapt the Cubic to suit these needs.